In Colorado’s rural areas, a small number of people with complex medical diagnoses are now receiving meals from Project Angel Heart! Our distribution coordinator, Matt Nigro, explains how we’re getting medically tailored meals to more people who need them. As you are aware, Kittleman & Associates has been selected to assist Project Angel Heart’s board of directors in conducting the president & CEO search. As background, Kittleman is the nation’s first executive search firm to provide recruitment services exclusively for nonprofit organizations. With offices in Chicago, Denver, and Philadelphia, Kittleman provides full-service, retained search services through our staff of nonprofit search consultants, research personnel and search operations specialists. Did you know that Project Angel Heart offers two meal delivery programs? Most meals are delivered via our core program, our legacy program where philanthropic investments fund meals for Coloradans who are ill. In 2016, we also started Meals for Care Transitions, a program where health care organizations reimburse Project Angel Heart to provide meals for their patients. This program gives health care providers and payers a way to support their patients’ health with delicious, medically tailored meals, and it allows Project Angel Heart the opportunity to provide food as medicine for more people in need. Twenty percent of the clients Project Angel Heart serves—about 250 people each week—live in the Colorado Springs area. 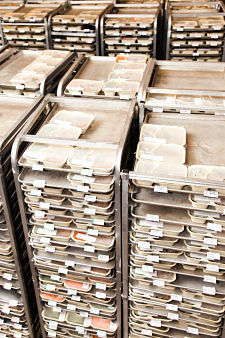 But all the meals are made in the kitchen in Denver… so how do they get where they need to go?